??? 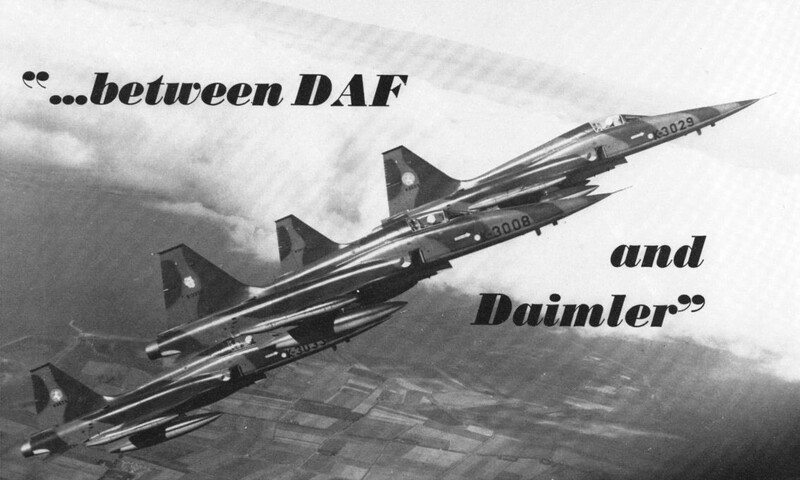 - "...between DAF and Daimler"
G.Morris - B-1: Deterrent or Dodo? 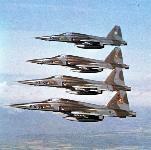 Flying from Eindhoven, Gilze Rijen and Twenthe, the NF-5 has, according to KLu pilots, returned to them "the flying capabilities of the old-style fighter", and conversion to the Northrop aeroplane from the Thunderstreak has been much like switching from an aged cart horse to a spirited filly. 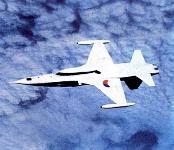 NF-5As of Nos 314 and 315 Tactical Fighter squadrons. A mix of NF-5As from Nos 314 and 315 Tactical Fighter Squadrons, the foremost and rear aircraft sporting the "Sagittarius" emblem of No 314 on their tail fins, and the nearest aircraft displaying the "Lion's Head" emblem on No 315. 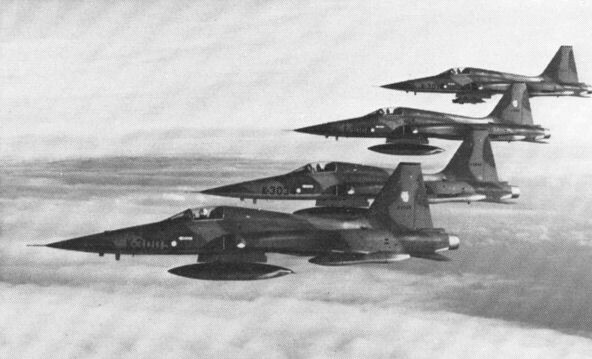 Four NF-5As from No 315 Tactical Fighter Squadron being seen in formation. 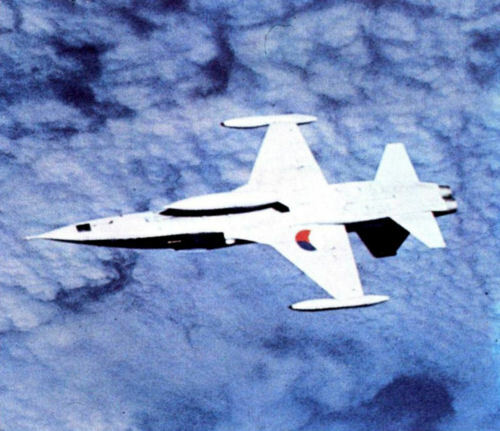 No 315 Tactical Fighter Squadron at Twenthe was the first KLu squadron to convert from the Republic F-84F Thunderstreak to the NF-5, and one of this unit's Thunderstreaks (53-6745) is seen here formating with one of the two-seat NF-5Bs (K-4010) of the conversion school in the summer of 1970 during the early stages on the conversion programme. 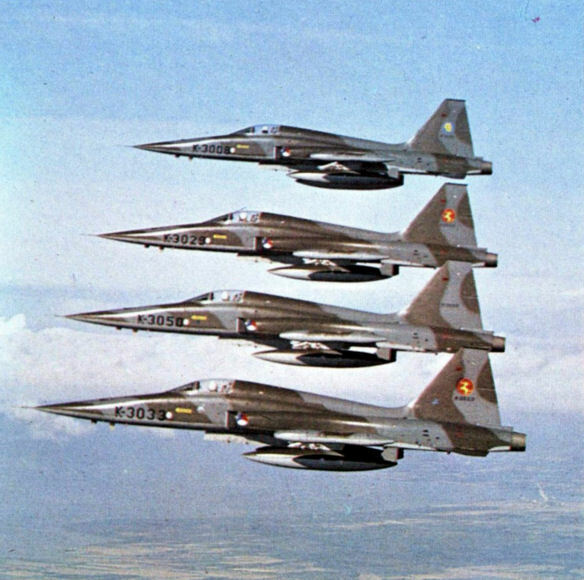 The trio of NF-5Bs include two of the first NF-5s ferried to the Netherlands, these (K-4005 and K-4006) arriving (together with K-4002 and K-4003 on 19 November 1969.